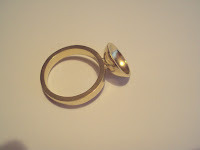 A while ago I attended a weekend jewellery course. The lady that runs it has two exercises that she gets new people in her class to do. The first is piercing (sawing) 5 lines as straight as possible and then drilling 16 holes in specific points. This is so that beginners can get used to piercing and drilling and also so that she can assess the skill of people that have been to the class before. The second exercise is a brass butterfly. 1. Clean metal by using a bit of emery paper, then putting in pickle and water. 2. 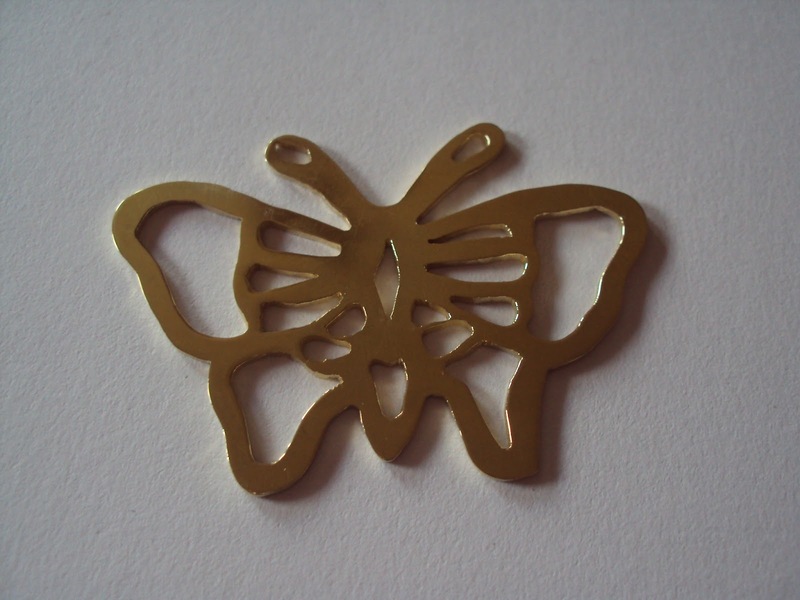 Superglue drawing of butterfly to metal. 3. Pierce out the outline of the butterfly.-A piercing saw is a saw that about a milimetre thick and 10mm long that is used to cut shapes out of metal. The handle of the saw can be wood or metal. 4. Use a centre punch to mark where you want drill holes for each of the inner bits of the butterfly. 6. Pierce out each of the inner shapes. 7. File the edges of the butterfly. The outer edges can be done with files while in some of the smaller or harder to reach space, use the side of a piercing saw as a file. You start with coarser files and then use finer files. The reason for this is that the coarser the file, the more metal is filed off so as you get nearer the shape you want, you want the finer files so that you don't file too much metal away. 8. Use emery paper to get the sides and edges as smooth and clean as possible. Again, use coarser paper first then move to finer paper. After making the butterfly, it was up to me what I wanted to make. I decided to make a ring. This ring is not my design. 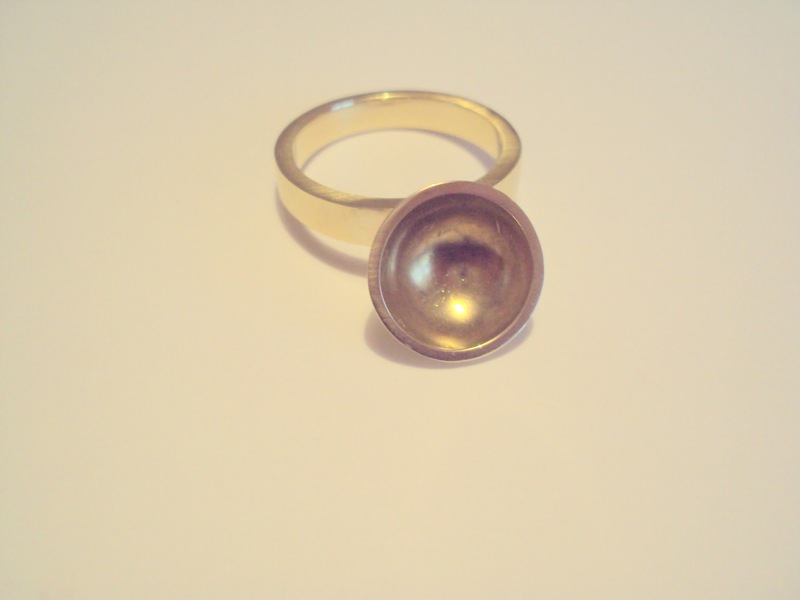 I made the ring out of brass. I decided to make this as the teacher had similar rings that previous students had made out of silver and I like the shape. It may not be clear from the photos above but the dome part is actually soldered at an angle which makes it slightly unusual. The reason that I did this course is because I would actually like to work in the crafts area. I have a jewellery qualification but I haven't made anything since finishing the course. I am thinking of applying to the jewellery course in Kilkenny. They only take people every second year but I think if I get accepted next year onto the course, then when I'm finished, I will feel that I have the right level of skill and knowledge to work in the industry. The lady that I did the weekend course with isn't planning on doing on any more weekend courses although she does week long courses and evening and morning classes but with the hours that I work, I don't know if I will get to learn from her again. This is a pity because her workshop is near where I live but also because she has different ways of doing things then my previous teachers so I think I could learn a lot from her. However there are a couple of other places that run weekend courses so I am hoping to get to a few of these so that I have a few new things to show if I get picked for an interview next year in Kilkenny.